or if he was scared enough to actually face the girl he would write a note. came up with a different idea to ask a girl to the prom. Brandon: Mom can you help me make huge cut out letters? Brandon: I want to ask her to the prom. Me: With huge cut out letters??? Brandon: Yes. Like Poster size. Being the wonderful Mom that I am, I bought poster board and cut out the letters and made a sign with her name. Note: It took me hours to draw and cut out the letters. Me: What are you going to do with the letters? Brandon: Ask her during the play off hockey game. This is when the creative juices start flowing. Brandon recruited fellow teammates to hold up the signs. Brandon is to the right of her name (with the C on his jersey). 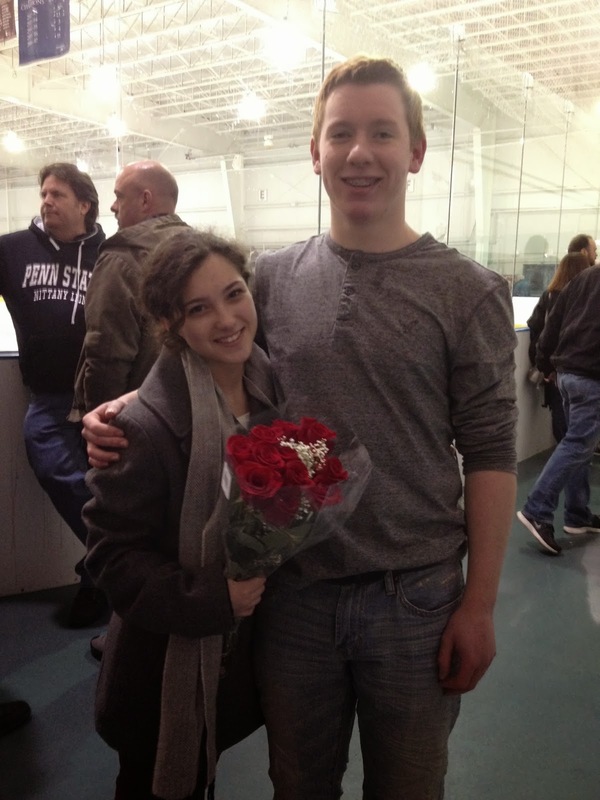 Courtney was in the stands (embarrassed) and said yes! Tami...that is the cutest thing I've ever seen! Who could resist saying, "No" to that? Awww.... I just loved that the first time I saw it. What a gentleman and true romantic I think you've raised! I show the video to anyone who will watch! haha! I asked Brandon what would happen if she said no. He said "Who would say no to this face?" What a character! wow you raised a romantic guy. Great plan and execution by your son - congrats. BTW - don't know if you got the reply from my blog - A little wikipedia searching - It features backing vocals by Michael McDonald and a guitar solo by Cross.